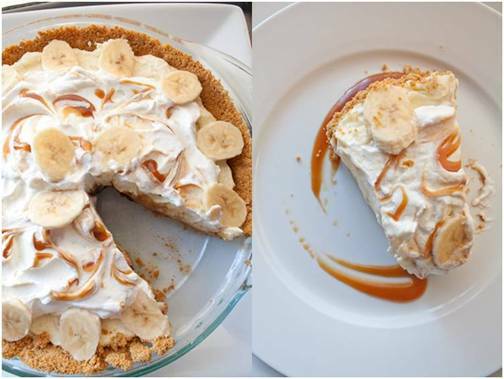 I've been dreaming of banana cream pie ever since I had a taste of Melissa Chou's (Aziza) deconstructed version inspired by The Essential New York Times Cookbook. I thoroughly enjoyed Chou's elegant take on the dessert, but I had a hankering for something a little homier. I had visions of a pretty Southern belle of a pie, with little flair, of course. A classic golden graham cracker crust coated with dark chocolate ganache, sweet bananas, thick vanilla-specked pastry cream, and pillows of soft whipped cream swirled with salted caramel. Mmm…I could almost taste it already. To start, I got my crust in order. 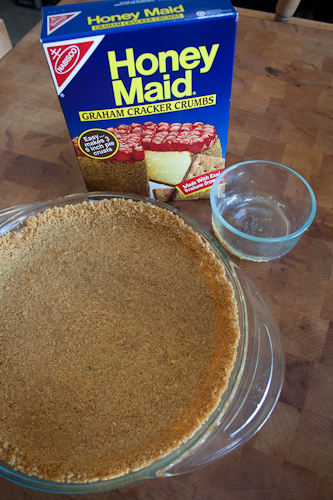 Honey Maid made it even easier than usual with pre-crushed graham cracker crumbs. I mixed it with some melted butter and a touch of sugar and baked it until it was golden brown and firmed up. Then, I coated the bottom with a rich layer of dark chocolate ganache (flair #1). For the pastry cream, I combined whole milk, sugar, and vanilla bean and let it come to a simmer. A tip with the vanilla bean, if it's too hard to split in half, throw the entire bean in the saucepan so that it softens as the milk warms up. Once it's pliable again, fish it out, splice it open, and scrape the seeds out. Meanwhile, I whisked together some sugar, cornstarch, and eggs. When the milk boiled, I whisked in the egg mixture. As it heated up again, the mixture thickened up to a pudding-like consistency. To finish off the pastry cream I folded in some freshly whipped cream and bananas. For my second bit of flair, I wanted to bring some burnt salted caramel into the picture. The subtle tinge of bitterness and pop of salt in the caramel added an interesting dimension to the mix. Plus, salted caramel is always a good decision in my book. Making caramel is surprisingly easy, but for some added reinforcement, I turned to David Lebovitz for some great detailed tips on making the perfect caramel. Now that all the pieces were ready, I layered in all the goodness and got ready for my dreams to come true. It was even better than I imagined it would be! The flavors complemented each other beautifully. 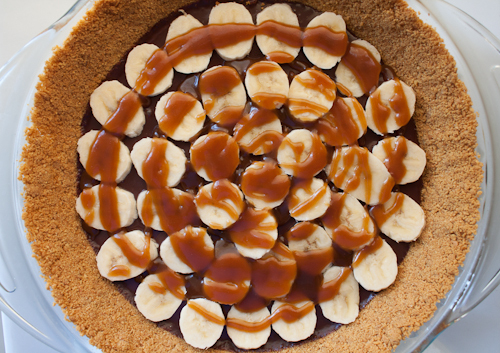 The banana and chocolate -– a classic combo -– but brought to another level of interesting with the addition of the salted caramel, which also played nicely with the buttery graham cracker crumbs. Cool, creamy, sweet, and decadent. This is the kind of pie you want to take home to meet the parents. Inspired by Amanda Hesser's The Essential New York Times Cookbook. 1. Preheat the oven to 325 F. Combine the crumbs and sugar in a bowl. Add the butter and mix until the crumbs are moistened. 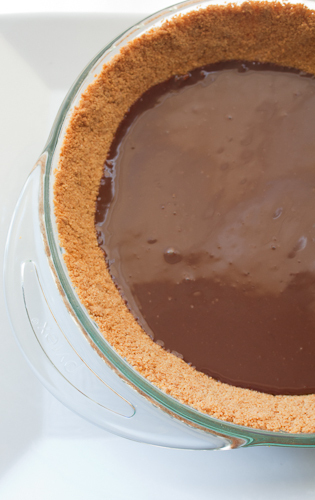 Pour the mixture into a 9-inch pie pan and use a flat-bottomed cup to press the crumbs evenly over the bottom; press it up the sides with your fingers. The edges of the shell will be crumbly. 2. Bake until lightly browned, 10-12 minutes. Cool completely. 3. Set the chocolate into a bowl. Heat the heavy cream to boiling point and pour over the chocolate. Let stand a couple of minutes and gently stir until fully incorporated and glossy. It should be the consistency of warmed chocolate syrup. Cool to room temperature. Pour over the cooled pie crust and refrigerate. 5. In a small bowl, sift the remaining 3 tablespoons of sugar together with the cornstarch. In a large bowl, whisk together the egg and yolks. 7. 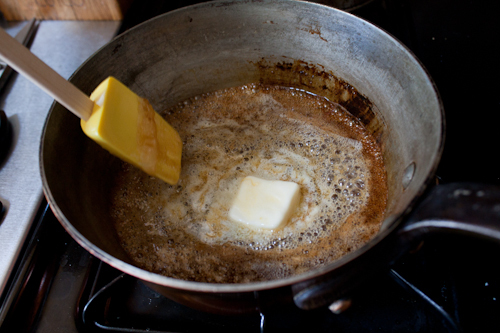 Remove from the heat and stir in the butter until incorporated. If the mixture isn't quite as smooth as you'd like, you can always run it through a sieve. Pour into a shallow bowl, place plastic wrap directly on the surface, and chill. 8. In a heavy saucepan set over medium-high heat, stir together sugar and water, and bring to a boil. Let boil until amber-colored. Once it starts taking on color, keep a close eye because it will turn quickly. 9. Immediately add butter and stir to incorporate. Remove from heat, add cream and salt (be careful, it will splatter), and mix well. It should be smooth and have a syrup-like consistency. Let cool to room temperature. 10. 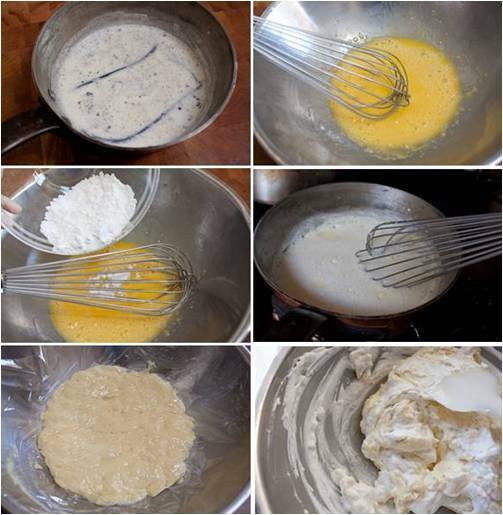 Using an electric mixer or a whisk, whip the heavy cream into peaks. Add powdered sugar and incorporate. Transfer the pastry cream to a large bowl and whisk until smooth. Fold in about half of the whipped cream. 11. 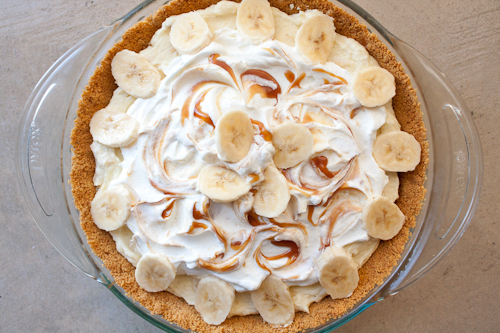 Line the bottom of the pie crust with a layer of bananas (approximately two bananas sliced into rounds). With the remaining banana, slice half if it into rounds for garnish, and roughly chop the other half to fold into the pastry cream. 12. Drizzle a thin layer of caramel sauce over the bananas. 13. Spoon the pastry cream evenly into the crust. Mound the remaining whipped cream on top. Drizzle some caramel sauce over the whipped cream, swirling it decoratively. Decorate with remaining banana slices. 14. Chill, and serve within 24 hours. Plate with remaining caramel sauce.